This ResourceSync specification describes a synchronization framework for the web consisting of various capabilities that allow third-party systems to remain synchronized with a server's evolving resources. The capabilities may be combined in a modular manner to meet local or community requirements. This specification also describes how a server should advertise the synchronization capabilities it supports and how third-party systems may discover this information. The specification repurposes the document formats defined by the Sitemap protocol and introduces extensions for them. This document is an HTML version of ANSI/NISO Z39.99-2017, an American National Standard developed by the National Information Standards Organization. Approved by the American National Standards Institute (ANSI) February 2, 2017. The front matter, authorship and acknowledgements of the PDF version are provided in Appendix C.
This specification is one of several documents comprising the ResourceSync Framework Specifications. The web is highly dynamic, with resources continuously being created, updated, and deleted. As a result, using resources from a remote server involves the challenge of remaining in step with its changing content. In many cases, there is no need to reflect a server's evolving content perfectly and, therefore, well-established resource discovery techniques, such as crawling, suffice as an updating mechanism. However, there are significant use cases that require low latency and high accuracy in reflecting a remote server's changing content. These requirements have typically been addressed by ad-hoc technical approaches implemented within a small group of collaborating systems. There have been no widely adopted, web-based approaches. This ResourceSync specification introduces a range of easy to implement capabilities that a server may support in order to enable remote systems to remain more tightly in step with its evolving resources. It also describes how a server should advertise the capabilities it supports. Remote systems may inspect this information to determine how best to remain aligned with the evolving data. Each capability provides a different synchronization functionality, such as a list of the server's resources or its recently changed resources, including what the nature of the change was: create, update, or delete. All capabilities are implemented on the basis of the document formats introduced by the Sitemap protocol. Capabilities may be combined to achieve varying levels of functionality and hence meet different local or community requirements. This modularity provides flexibility and makes ResourceSync suitable for a broad range of use cases. Many projects and services have synchronization needs and have implemented ad hoc solutions. ResourceSync provides a standard synchronization method that will reduce implementation effort and facilitate easier reuse of resources. This section describes motivating examples with differing needs and complexities. Consider first the case of a website for a small museum collection. The website may contain just a few dozen static webpages. The maintainer may create a Resource List of these webpages and expose it to services that leverage ResourceSync. When building services over Linked Data, it is often desirable to maintain a local copy of data for improved access and availability. Harvesting may be enabled by publishing a Resource List for the dataset. In many cases, resource representations exposed as Linked Data are small and so retrieving them via individual HTTP GET requests is slow because of the large number of round trips for a small amount of content. Publishing a Resource Dump that points to content packaged and described in ZIP files makes this more efficient for the client and less burdensome for the server. Continued synchronization is enabled by recurrently publishing an up-to-date Resource List or Resource Dump, or, more efficiently, by publishing a Change List that provides information about resource changes only. Repositories of scholarly articles and data have typically shared metadata via OAI-PMH. As these repositories are rearchitected to become resource- or web-centric, the ResourceSync Framework enables sharing of both metadata and content with aggregators and commodity web search engines alike. Publication of a Resource List -- compatible with Sitemaps -- provides the base level of interoperability and enables indexing by commodity web search engines. Use of other capabilities such as Resource Dumps, Change Lists, and Change Dumps supports easier initial synchronization and more efficient increment updates. ResourceSync supports synchronization of both Resources and Metadata about Resources with the relationships clearly indicated. It also enables expression of different sets of resources via the Source Description to support use cases requiring synchronization of subsets of a repository's content. Let's assume a Source, http://example.com/, that exposes changing content that others would like to remain synchronized with. A first step towards making this easy for Destinations is for the Source to publish a Resource List that conveys the URIs of resources available for synchronization. This Resource List is expressed as a Sitemap. As shown in Example 1, the Source conveys the URI of each resource as the value of the <loc> child element of a <url> element. Note the <rs:md> child element of the <urlset> root element, which expresses that the Sitemap implements ResourceSync's Resource List capability. It also conveys that the Resource List reflects the state of the Source's resources at the datetime provided in the at attribute. This datetime allows a Destination to quickly determine whether it has previously processed this specific Resource List. The Source can provide additional information in the Resource List to help the Destination optimize the process of collecting content and verifying its accuracy. For example, when the Source expresses the datetime of the most recent modification for a resource, a Destination can determine whether or not it already holds the current version, minimizing the number of HTTP requests it needs to issue in order to remain up-to-date. Example 2 shows this information conveyed using Sitemap's optional <lastmod> element. When the Source also conveys a hash for a specific bitstream, a Destination can verify whether the process of obtaining it was successful. The example shows this information conveyed using the hash attribute on the <rs:md> element. In addition, the Source can provide links to related resources using the <rs:ln> element. The example shows a link to a mirror copy of the second listed resource, indicating that the Source would prefer a Destination to obtain the resource from it. Example 3 shows a Change List. The value of the capability attribute of the <rs:md> child element of <urlset> makes it clear that, this time, the Sitemap is a Change List and not a Resource List. The from and until attributes give the temporal interval covered by the Change List. The Change List shown below conveys three resource changes: one an update, another a deletion, and the third a creation. The change types can be seen from the value of the change attribute of each <rs:md> element. The example also shows the use of the <lastmod> element to convey the modification times of the resources, and the datetime attribute of <rs:md> to convey the change time. In the case of the created resource, the datetime conveyed by the <lastmod> element is earlier than that of the datetime attribute, perhaps because the repository made an old file visible only at the datetime given. Note that the changes are listed in chronological order by update time, which may be given as values of the datetime attribute. A Destination can issue HTTP GET requests against each resource URI listed in a Resource List. For large Resource Lists, issuing all of these requests may be cumbersome. Therefore, ResourceSync introduces a capability that a Source can use to make packaged content available. A Resource Dump, implemented as a Sitemap, contains pointers to packaged content. Each content package referenced in a Resource Dump is a ZIP file that contains the Source's bitstreams along with a Resource Dump Manifest that describes each. The Resource Dump Manifest itself is also implemented as a Sitemap. A Destination can retrieve a Resource Dump, obtain content packages by dereferencing the contained pointers, and unpack the retrieved packages. Since the Resource Dump Manifest also lists the URI the Source associates with each bitstream, a Destination is able to achieve the same result as obtaining the data by dereferencing the URIs listed in a Resource List. Example 4 shows a Resource Dump that points at a single content package. Dereferencing the URI of that package leads to a ZIP file that contains the Resource Dump Manifest shown in Example 5. It indicates that the Source's ZIP file contains two bitstreams. The path attribute of the <rs:md> element conveys the file path of the bitstream in the ZIP file (the relative file system path where the bitstream would reside if the ZIP were unpacked), whereas the <loc> element conveys the URI associated with the bitstream at the Source. An additional capability, the Change Dump, provides a functionality similar to a Resource Dump but pertains to packaging bitstreams of resources that have changed during a temporal interval, instead of packaging a snapshot of resource bitstreams at a specific moment in time. ResourceSync also introduces a Capability List, which is a way for the Source to describe the capabilities it supports for one set of resources. Example 6 shows such a description. It indicates that the Source supports the Resource List, Resource Dump, and Change List capabilities and it lists their respective URIs. Note the inclusion of an <rs:ln> child element of <urlset> that links by means of a describedby relation to a description of the set of resources covered by the Capability List. Because these capabilities are conveyed in the same Capability List, they uniformly apply to this set of resources. For example, if a given resource appears in the Resource List then it must also appear in a Resource Dump and changes to the resource must be reported in the Change List. There are three ways by which a Destination can discover whether and how a Source supports ResourceSync: a Source-wide approach, a resource-specific approach, and an approach that leverages existing practice for discovering Sitemaps. The Source-wide approach leverages the well-known URI specification and consists of the Source making a Source Description, like the one shown in Example 7, available at /.well-known/resourcesync. The Source Description enumerates the Capability Lists a Source offers, one Capability List per set of resources. If a Source only has one set of resources and hence only one Capability List, the mandatory Source Description contains only one pointer. The resource-specific discovery approach consists of a Source providing a link in an HTML document or in an HTTP Link header that points at a Capability List that covers the resource that provides the link. Note in Example 6 the inclusion of an <rs:ln> child element of <urlset> that links by means of an up relation to the Source Description, allowing for navigation from a Capability List to a Source Description. Yet another approach follows the established practice for discovering Sitemaps via a Source's robots.txt file. Since a Resource List is a Sitemap it can be made discoverable by including its URI in the robots.txt file as the value of the Sitemap directive. A navigational up link included in the Resource List allows discovery of a Capability List pertaining to the set of resources covered by that Resource List, and a further up link in the Capability List leads to the Source Description. In some cases, there is a need to split the documents described so far into parts. For example, the Sitemap protocol currently prescribes a maximum of 50,000 resources per Sitemap and a Source may have more resources that are subject to synchronization. The ResourceSync framework follows these community defined limits and hence, in such cases, publishes multiple Resource Lists as well as a Resource List Index that points to each of them. The Resource List Index is expressed using Sitemap's <sitemapindex> document format. Example 8 shows a Resource List Index that points at two Resource Lists. The following documents contain provisions that are required for implementing this standard. All standards are subject to revision; the most current version of these standards should be used. The following terms, as used in this standard, have the meanings indicated. This specification uses the terms resource, representation, request, response, content negotiation, client, and server as described in Architecture of the World Wide Web. Section 1.3 provides a concrete walkthrough of some capabilities that a Source may implement and describes how a Destination may use those capabilities to remain synchronized with the Source's changing data. This section provides a high-level overview of the various ResourceSync capabilities and shows how these fit into processes at a Destination designed to keep it in step with changes. Describing Content -- In order to describe its data, a Source may maintain an up-to-date Resource List. A basic Resource List minimally provides the URIs of resources that the Source makes available for synchronization. However, additional information may be added to the Resource List to optimize the Destination's process of obtaining the Source's resources, including the most recent modification time of resources and fixity information such as content-based checksum or hash and length. Figure 1 shows a Source publishing up-to-date Resource Lists at times t2 and t4. At t4, too many resources need to be listed to fit in a single Resource List and hence multiple Resource Lists are published and grouped in a Resource List Index. Packaging Content -- In order to make its data available for download, a Source may recurrently make an up-to-date Resource Dump of its content available. A Resource Dump points at one or more packages, each of which contains bitstreams associated with resources hosted by the Source. Each package also contains a Resource Dump Manifest that provides metadata about the bitstreams contained in the package, and must minimally include their associated URI and their file path in the ZIP file. Figure 1 shows a Source publishing up-to-date Resource Dumps at times t1 and t3. At time t3, multiple Resource Dumps are published and grouped in a Resource Dump Index. Describing Changes -- In order to achieve lower synchronization latency and/or to improve transfer efficiency, a Source may publish a Change List that provides information about changes to its resources. It is up to the Source to decide the temporal interval covered by a Change List, for example, all the changes that occurred during the previous hour, the current day, or since the most recent publication of a Resource List. For each resource change, a Change List must minimally convey the URI of the changed resource as well as the nature of the change (create, update, delete). Since a Change List is organized on the basis of changes, it may list the same resource multiple times, once per change. Figure 2 shows three Change Lists. The first Change List covers resource changes that occurred between t1 and t3, the second between t3 and t5, and the third between t5 and t7. Since too many changes occurred between t5 and t7 to fit in a single Change List, multiple Change Lists are published and grouped in a Change List Index. Packaging Changes -- In order to make content changes available for download, a Source may publish a Change Dump. A Change Dump points at one or more packages, each of which contains bitstreams that correspond to the state of resources after they changed. Each package also contains a Change Dump Manifest that provides metadata about the bitstreams provided in the Change Dump. For each bitstream, the Change Dump Manifest must minimally include the associated URI, the nature of the change (create, update, delete) and, where appropriate, the file path of the bitstream in the ZIP file. It is up to a Source to decide the temporal interval covered by a Change Dump, for example, covering all the resource changes that occurred during the previous hour, the current day, or since the most recent publication of a Resource Dump. Since a Change Dump is organized on the basis of changes, the package(s) it points at may contain multiple bitstreams associated with any given resource, one per change. Figure 2 shows three Change Dumps. The first Change Dump covers resource changes that occurred between t2 and t4, the second between t4 and t6, and the third between t6 and t8. During the time period between t6 and t8, multiple Change Dumps are published and grouped in a Change Dump Index. Alternate Content Transfer -- The default mechanisms by which a Destination obtains content for a resource are to issue an HTTP GET against its URI found in a Resource List or Change List, or to unpack packages obtained via a Resource Dump or Change Dump. However, additional approaches may also be supported. For example, a Source may prefer, for synchronization purposes, that content be obtained from a mirror server and hence from a different URI. Also, a Source may allow obtaining only the changes that a resource underwent, instead of the entire changed resource. This may be desirable when the resource size is considerable and/or the frequency of changes high. Such an Alternate Content Transfer approach is expressed by means of a link from the resource to another resource that makes the content available in an alternate way. It is possible that certain Destinations do not recognize a specific Alternate Content Transfer approach, in which case ignoring the link and dereferencing the resource's URI remains the fallback approach. Resources and Metadata about Resources -- Cases exist where both resources and metadata about resources must be synchronized, for example, a collection of scientific publications and metadata describing each. From the ResourceSync perspective, both the resource and the metadata about it are regarded as resources with distinct URIs that are subject to synchronization. Their inter-relationship is expressed by means of links with appropriate relation types. Prior Versions of Resources -- In some cases a Destination requires a copy of each version of a resource, not just the most recent one. A Source may support discovery and access to prior resource versions through links. Three approaches are provided, one based on linking to resource versions, and two that leverage features of the Memento protocol for time-based access to resource states. Baseline Synchronization -- In order to become synchronized with a Source, the Destination must make an initial copy of the Source's data. A Destination may obtain the Resource List that conveys the URIs of the Source's resources, and subsequently dereference those URIs one by one. A Destination may also obtain a Resource Dump that conveys the URIs of one or more content packages each of which contains bitstreams associated with the Source's resources. A Destination may dereference those URIs and subsequently unpack the retrieved content packages, guided by the contained Resource Dump Manifest. Incremental Synchronization -- A Destination may remain in sync with a Source by repeatedly performing a Baseline Synchronization. To increase efficiency and decrease latency, a Source may communicate information about changes to its resources via Change Lists. This allows a Destination to obtain up-to-date content by dereferencing the URIs of newly created and updated resources listed in the Change List. It also allows a Destination to remove its copies of deleted resources, if needed. A Source may also make a Change Dump available that points at one or more packages, each of which contains bitstreams that correspond to the state of resources after they changed. In this case the Destination first obtains the Change Dump, then obtains the package(s) by dereferencing the URI(s) listed in the Change Dump, and subsequently unpacks those, guided by the contained Change Dump Manifest. Audit -- In order to verify whether it is in sync with the Source, a Destination must be able to check that the content it obtained matches the current resources hosted by the Source both regarding coverage and accuracy. This requires an up-to-date list of resources hosted by the Source, which may be compiled on the basis of a Resource List and Change Lists. It also requires these Lists to contain metadata per resource that characterizes its most recent state, such as last modification time, length, and content-based hash. Table 1 provides a summary of Section 5. The table lists Destination processes as columns and Source capabilities as rows, with cells indicating the applicability of a capability for a given process. At the top of the picture is the mandatory Source Description. It is a Destination's typical entry point to learn about a Source's ResourceSync implementation. The Source Description enumerates all Capability Lists offered by the Source, one Capability List per set of resources. If the Source only offers one set of resources, the ResourceSync Description contains a single pointer. A Source Description is expressed as a <urlset> document and, per Capability List, a <url> element is introduced. The <loc> child element of <url> contains the URI of the Capability List, and the capabilitylist value for the capability attribute of the <rs:md> child element of <url> makes clear that the URI is that of a Capability List. A Capability List enumerates all capabilities supported for a set of the Source's resources. 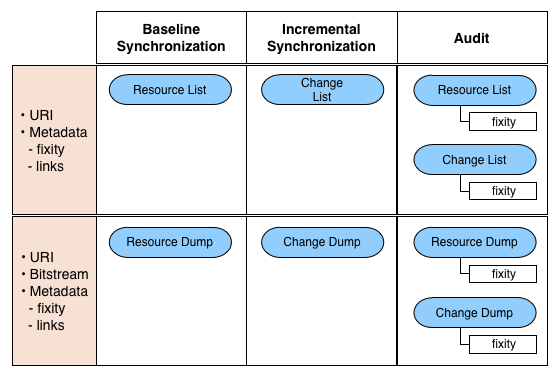 The capabilities defined in this ResourceSync specification are Resource List, Change List, Resource Dump, and Change Dump. Additional capabilities may be defined in other specifications. A Capability List is expressed as a <urlset> document and, for each supported capability, a <url> element is introduced. The <loc> child element of <url> contains the URI of the document that implements a capability, and the type of capability is expressed by means of the value of the capability attribute of the <rs:md> child element of <url>, e.g., resourcelist for a Resource List. A Resource List and a Change List point at resources. A representation of a resource may be obtained by dereferencing its URI, listed as the value of the <loc> child element of the <url> element for the resource. A Resource Dump and a Change Dump point at packages, each of which contains bitstreams associated with resources, as well as a Manifest that describes the bitstreams provided in the package. The Manifest contained in a package of bitstreams is expressed as a <urlset> document. For each bitstream contained in the package, that document contains a <url> element; the <loc> child element of <url> provides the URI that corresponds to the bitstream, whereas the path attribute of the <rs:md> child element of <url> provides the path of the bitstream in the package. If a single document suffices to express a Source Description, a Resource List, a Change List etc., then the <urlset> document format is used. If multiple documents are required, each is expressed using the <urlset> document format, and a <sitemapindex> document is introduced as an index to point at all individual <urlset> documents. As a result, the URI of, for example, a Resource List provided in a Capability List may be either that of a <urlset> or a <sitemapindex> document. The <urlset> or <sitemapindex> documents used for a specific capability (e.g., Resource List) have the same value for the capability attribute (e.g., resourcelist). The Resource List branch of Figure 4 is fully compatible with the existing Sitemap specification, whereas the other branches are extensions introduced to support resource synchronization that leverage the Sitemap document formats. A link for upward navigation is provided by means of an <rs:ln> child element of the <urlset> or <sitemapindex> element of a document. This pointer has up as the value for the rel attribute, and the URI of the document that sits higher in the hierarchy is provided as the value of the href attribute. Following consecutive up links eventually leads to the Source Description. A link for navigation from a document to the index under which it resides, if one exists, is provided by means of an <rs:ln> child element of the <urlset> element of the document. This pointer has index as the value for the rel attribute, and the URI of the index document is provided as the value of the href attribute. A link for downward navigation is provided by the content of a <url> element: the URI of the document that sits lower in the hierarchy is provided as the value of its <loc> child element, and its type is conveyed as the value of the capability attribute of the <rs:md> child element. ResourceSync provides three ways for a Destination to discover whether and how a Source supports ResourceSync: a Source-wide approach detailed in Section 6.3.2, a resource-specific approach detailed in Section 6.3.3, and an approach that leverages the existing practice of Sitemap discovery via the robots.txt file described in Section 6.3.4. All approaches are summarized in Figure 7. A Source must publish a Source Description, such as the one shown in Example 7, and it should be published at the well-known URI [RFC 5785] /.well-known/resourcesync as defined here. The Source Description document enumerates a Source's Capability Lists and as such is an appropriate entry point for Destinations interested in understanding a Source's capabilities. A Capability List may be made discoverable by means of links provided either in an HTML document [HTML Links, XHTML Links] or in an HTTP Link header [RFC 5988]. In order to include a discovery link in an HTML document, a <link> element is introduced in the <head> of the document that points to a Capability List. This <link> must have a rel attribute with a value of resourcesync. The Capability List that is made discoverable in this way must pertain to the resource that provides the link. This means that the resource must be covered by the capabilities listed in the linked Capability List. Example 9 shows the structure of a webpage that contains a link to a Capability List. As shown in Example 6 the Source Description can be discovered from the Capability List by following the link provided in the <rs:ln> element with the relation type up. A Capability List may also be made discoverable by means of an HTTP Link header that may be included with a representation of a resource of any content-type. In order to do so, a link is introduced in the HTTP Link header. The target of this link is the URI of a Capability List and the value of its rel attribute is resourcesync. The Capability List that is made discoverable in this way must pertain to the resource that provides the link. 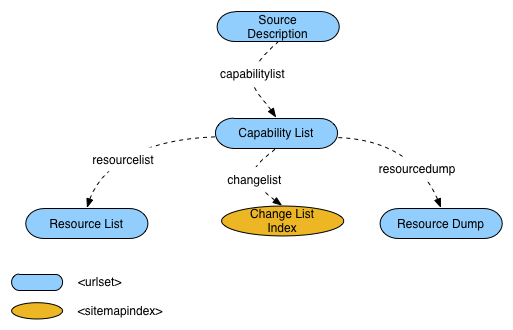 This means that the resource must be covered by the capabilities listed in the linked Capability List. Example 10 shows an excerpt of an HTTP response header that illustrates this approach. As shown in Example 6 the Source Description can be discovered from the Capability List by following the link provided in the <rs:ln> element with the relation type up. A Resource List is a Sitemap and hence may be made discoverable via the established approach of adding a Sitemap directive to a Source's robots.txt file that has the URI of the Resource List as its value. If a Source supports multiple sets of resources, multiple directives may be added, one for each Resource List associated with a specific set of resources. 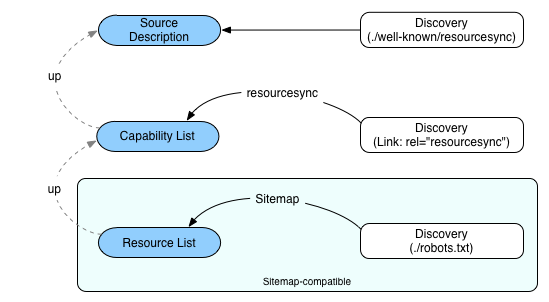 In case a Source supports both regular Sitemaps and ResourceSync Sitemaps (Resource Lists) they may be made discoverable, again, by including multiple Sitemap directives as shown in Example 11. Once a Resource List for a set of resources has been discovered in this manner, the corresponding Capability List can be discovered by following a link with the up relation type provided in the Resource List. Next, the Source Description can be discovered by following yet another link with the up relation type provided in the Capability List. In order to convey information pertaining to resources in the ResourceSync framework, the Sitemap (root element <urlset>) and Sitemap index (root element <sitemapindex>) document formats introduced by the Sitemap protocol are used for a variety of purposes. The <sitemapindex> document format is used when it is necessary to group multiple documents of the <urlset> format. The ResourceSync framework follows community-defined limits for when to publish multiple documents of the <urlset> format. At time of publication of this specification, the limit is 50,000 items per document and a document size of 50 MB. The document formats, as well as their ResourceSync extension elements, are shown in Table 2. The <rs:md> and <rs:ln> elements are introduced to express metadata and links, respectively. Both are in the ResourceSync XML Namespace and may have attributes. The attributes of these elements defined by ResourceSync are listed in Table 3 and detailed below. As shown in the examples, these attributes must not have an XML Namespace prefix. The <rs:ln> element as well as several of the ResourceSync attributes are based upon other specifications and in those cases inherit the semantics defined there; the "Specification" column of Table 3 refers to those specifications. Communities may introduce additional attributes when needed but must use an XML Namespace other than that of ResourceSync and must appropriately use namespace prefixes for those attributes. 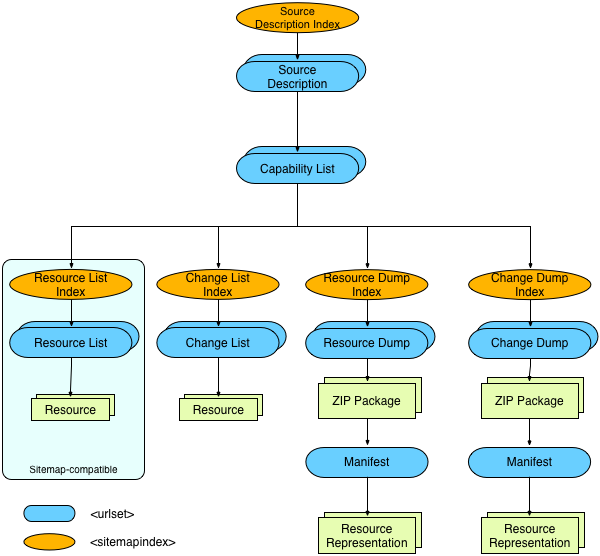 at -- This attribute is used for Resource Lists, Resource List Indexes, Resource Dumps, Resource Dump Indexes, and Resource Dump Manifests; it is not used for Change Lists, Change List Indexes, Change Dumps, Change Dump Indexes, and Change Dump Manifests. Required use of the attribute is detailed in the sections describing the respective documents and summarized in Appendix A. The at attribute conveys the datetime at which the process of taking a snapshot of resources for their inclusion in the document to which the attribute pertains started. It thus provides a guarantee that each resource state represented in the document is the result of all changes to the resource at least up until the datetime expressed as the value of the at attribute. The attribute value is expressed as a W3C Datetime and the use of a complete date and time expressed in UTC using the format YYYY-MM-DDThh:mm:ss[.s]Z is recommended. The attribute represents the time of a snapshot such as t1, t2, t3, and t4 of Figure 1.
capability -- This attribute is mandatory in all ResourceSync documents. The value of the attribute conveys the nature of the document, e.g., whether the document is a Resource List, a Change List, a Manifest, etc. Defined values are resourcelist, changelist, resourcedump, changedump, resourcedump-manifest, changedump-manifest, capabilitylist, and description. completed -- This optional attribute is used for Resource Lists, Resource List Indexes, Resource Dumps, Resource Dump Indexes, and Resource Dump Manifests; it is not used for Change Lists, Change List Indexes, Change Dumps, Change Dump Indexes, and Change Dump Manifests. The completed attribute conveys the datetime at which the process of taking a snapshot of resources for their inclusion in the document to which the attribute pertains completed. The combination of the datetimes provided in the at and completed attributes expresses an interval during which resources may have changed beyond the state they had at the datetime expressed in the at attribute. The attribute value for completed is expressed as a W3C Datetime and the use of a complete date and time expressed in UTC using the format YYYY-MM-DDThh:mm:ss[.s]Z is recommended. from -- This attribute is used for Change Lists, Change List Indexes, Change Dumps, Change Dump Indexes, and Change Dump Manifests; it is not used for Resource Lists, Resource List Indexes, Resource Dumps, Resource Dump Indexes, and Resource Dump Manifests. Required use of the attribute is detailed in the sections describing the respective documents and summarized in Appendix A. The attribute indicates that all changes that occurred to the set of resources at the Source since the datetime expressed (and up until the datetime expressed in the until attribute, if it exists) are included in the document to which the attribute pertains. The attribute value is expressed as a W3C Datetime and the use of a complete date and time expressed in UTC using the format YYYY-MM-DDThh:mm:ss[.s]Z is recommended. For example, the first Change List in Figure 2 would have a from value of t1, and the second Change List would have a from value of t3. until -- This optional attribute is used for Change Lists, Change List Indexes, Change Dumps, Change Dump Indexes, and Change Dump Manifests; it is not used for Resource Lists, Resource List Indexes, Resource Dumps, Resource Dump Indexes, and Resource Dump Manifests. The attribute indicates that all changes that occurred to the set of resource at the Source up until the datetime expressed are included in the document to which the attribute pertains. When a document carries the until attribute, this indicates that the document will not be updated anymore. When a change document does not carry the until attribute, any subsequent changes to the corresponding set of resources will cause the document to be updated. The attribute value is expressed as a W3C Datetime and the use of a complete date and time expressed in UTC using the format YYYY-MM-DDThh:mm:ss[.s]Z is recommended. For example, the first Change List in Figure 2 would have an until value of t3 and the second Change List would have an until value of t5. href -- A mandatory attribute to convey the URI of the other document. describedby -- for linking from a Capability List to a document that describes the set of resources covered by it, and from a Source Description to a document that describes the Source. up -- for linking from a Capability List to the Source Description and from a document that conveys a capability, such as a Resource List, to the Capability List under which it resides. index -- for linking from a document that conveys a capability (e.g., a Resource List) to a parent index document (e.g., a Resource List Index). <loc> -- A mandatory element that conveys the URI of the resource that plays a role in the ResourceSync framework. <lastmod> -- An element that conveys the last modification time of the resource with the URI provided in <loc>, as defined in RFC 2616, Sec. 14.29. The value is expressed as a W3C Datetime as described earlier in this section. The use of <lastmod> is optional in all ResourceSync documents. Note that there is significant variation in practices for the use and maintenance of last modification times, the time expressed may not correspond with the datetime of the last ResourceSync change event, or fall within the from and until datetimes of a Change List or Change Dump Manifest that includes the resource. <changefreq> -- An optional element that provides a hint about the change frequency of the resource with the URI provided in <loc>. Defined values are always, hourly, daily, weekly, monthly, yearly, and never. The value always should be used for resources that change each time they are accessed. The value never should be used for archived resources. at and completed -- The semantics and value of these attributes are as defined earlier in this section. They are only used for Resource List Indexes, Resource Dumps, and Resource Dump Indexes. Required use of the attributes is detailed in the sections describing the respective documents and summarized in Appendix A.
capability -- This attribute is mandatory in Source Descriptions and Capability Lists. Its value indicates the nature of the resource identified by the URI in the <loc> element, e.g., a Resource List, a Change List, a Change Dump, etc. Values defined in this specification are resourcelist, changelist, resourcedump, changedump, and capabilitylist. change -- The value of the attribute conveys the type of change that a resource underwent. Values defined in this specification are created, updated, and deleted, which convey the creation, update, and deletion of a resource, respectively. This attribute is used in Change Lists (Section 12.1) and Change Dump Manifests (Section 13.2). datetime -- The value of the attribute conveys the datetime of the change event for the resource. The value is expressed as a W3C Datetime as described earlier in this section. This attribute may be used in Change Lists (Section 12.1) and Change Dump Manifests (Section 13.2). The value must be equal to or after the from datetime, and before or equal to the until datetime if specified. encoding -- The value of the attribute conveys what content codings have been applied to the resource. The value of the encoding attribute should be equal to the value of the content-encoding header in the HTTP response as defined in RFC 2616, Sec. 14.11.
from and until -- The semantics and value of these attributes are as defined earlier in this section. They are only used for Change List Indexes, Change Dumps, and Change Dump Indexes. Required use of the attributes is detailed in the sections describing the respective documents and summarized in Appendix A.
hash -- The value of the attribute conveys fixity information for a resource representation returned when the URI in <loc> is dereferenced. The attribute value is expressed in the form of a whitespace-delimited list of hash values. Each hash value is represented by a hex-encoded digest and is preceded by a token that identifies the utilized hash algorithm, e.g., md5:, sha-256:. length -- The value of the attribute conveys the content length of a resource representation returned when the URI in <loc> is dereferenced. The value of the length attribute should be equal to the value of the Content-Length header in the HTTP response and must be computed as defined in RFC 2616, Sec. 4.4.
path -- The attribute is only used in Resource Dump Manifests (Section 11.2) and Change Dump Manifests (Section 13.2). Its value conveys the file path of the bitstream associated with the URI in <loc> in the ZIP file. That is the relative file system path where the bitstream would reside if the ZIP were unpacked. type -- The value of the attribute conveys the Media Type of a resource representation returned when the URI in <loc> is dereferenced. Registered values are listed in the IANA MIME Media Type registry. href -- A mandatory attribute to convey the URI of the related resource. contents -- for a link from an entry in a Resource Dump or Change Dump that points to a bitstream package to a Resource Dump Manifest or to a Change Dump Manifest, respectively, for that bitstream package. duplicate -- for a link to a resource's mirror location. alternate and canonical -- for a link to an alternate representation of a resource. http://www.openarchives.org/rs/terms/patch -- for a link to a resource that details the difference between the previous and current version of a resource. describedby and describes -- for a link providing additional information about a resource. memento and timegate -- for a link to access prior versions of a resource. collection -- for a link that expresses collection membership. via -- for a link that provides provenance information. encoding, hash, length, modified, path, type -- Optional attributes with meanings as described earlier in this section and pertaining to the related resource. pri -- An optional attribute used to express a priority among links with the same relation type. The attribute value is an integer between 1 and 999,999, with a lower integer indicating a higher priority and the absence of the attribute indicating a value of 999,999. Table 3 lists the elements used in ResourceSync documents and for each shows the attributes defined by ResourceSync that may be used with them. The "Specification" column refers to the specification where elements or attributes were introduced that ResourceSync equivalents are based upon and from where they inherit their semantics. A mark in the "Representation" column for an attribute indicates that it should only be used when a specific representation of a resource is concerned, whereas a mark in the "Resource" column indicates it is usable for a resource in general. A W3C XML Schema (available at http://www.openarchives.org/rs/resourcesync.xsd) is provided to validate the elements introduced by ResourceSync. Relation types other than the ones listed above may be used in the ResourceSync Framework. Valid relation types must be registered in the IANA Link Relation Type Registry or expressed as URIs as specified in RFC 5988, Sec. 4.2. The document Relation Types Used in the ResourceSync Framework attempts to provide an up-to-date overview. A Source Description is a mandatory document that enumerates the Capability Lists offered by a Source. Since a Source has one Capability List per set of resources that it distinguishes, the Source Description will enumerate as many Capability Lists as the Source has distinct sets of resources. The mandatory <rs:md> child element of <urlset> must have a capability attribute that has a value of description. A recommended <rs:ln> child element of <urlset> with the relation type describedby points to a document that provides information about the Source. A mandatory <loc> child element provides the URI of the respective Capability List. An optional <rs:md> child element must have a capability attribute with a value of capabilitylist to convey that the URI points to a Capability List. A recommended <rs:ln> child element with a describedby relation type points to a document that describes the set of resources described by the Capability List. The <lastmod> elements should be omitted from the Source Description unless the Source updates the Source Description every time it updates one of the Capability Lists. Example 12 shows a Source Description where the Source offers three Capability Lists. If a Source needs to or chooses to publish multiple Source Descriptions, it must group them by means of a Source Description Index. A Capability List is a document that enumerates all capabilities supported by a Source for a specific set of resources. The Source defines which resources are part of the set of resources described by the Capability List. If there is more than one such set, then the Source must distinguish them with different capability lists. The choice of which resources are part of which set may derive from a variety of criteria, including media type, collection membership, change frequency, subject of the resource and many others. A Capability List points at the capability documents for its set of resources: Resource List (Section 10.1), Resource Dump (Section 11.1), Change List (Section 12.1), and Change Dump (Section 13.1). A Capability List must only contain one entry per capability. Capabilities that are conveyed in the same Capability List uniformly apply to the set of resources covered by that Capability List. For example, if a Capability List enumerates a Resource List, a Resource Dump, and a Change List, then a given resource that appears in a Resource List must also appear in a Resource Dump, and changes to the resource must be conveyed in the Change List. The mandatory <rs:md> child element of <urlset> must have a capability attribute that has a value of capabilitylist. A mandatory <rs:ln> child element of <urlset> with the relation type up points to the Source Description document that enumerates all Capability Lists offered by the Source. A recommended <rs:ln> child element of <urlset> with the relation type describedby points to a document that provides information about the set of resources covered by the Capability List. A mandatory <loc> child element provides the URI of the respective capability document. A mandatory <rs:md> child element must have a capability attribute to convey the type of the respective capability. The <lastmod> elements should be omitted from the Capability List unless the Source updates the Capability List every time it updates one of the capability documents. 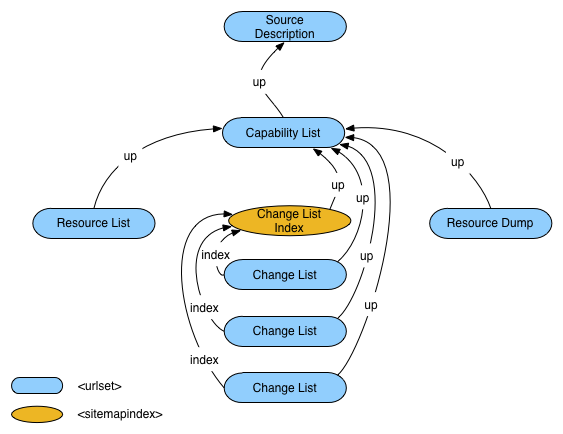 Example 13 shows a Capability List where the Source offers four capabilities: a Resource List, a Resource Dump, a Change List, and a Change Dump. A Destination cannot determine from the Capability List whether a Source provides, for example, a Resource List Index or a single Resource List. The capability document must be downloaded to make this determination: a document with a <sitemapindex> root element is an index, a document with a <urlset> root element is not. ResourceSync defines only a small number of capabilities, and enumerating those does not approach the limits of a single Capability List. Thus no <sitemapindex> document structure is necessary and Sources should not generate such structures. A Source may publish a description of the resources it makes available for synchronization. This information enables a Destination to make an initial copy of some or all of those resources, or to update a local copy to remain synchronized with changes. A Resource List is introduced to list and describe the resources that a Source makes available for synchronization. It presents a snapshot of a Source's resources at a particular point in time. The mandatory <rs:md> child element of <urlset> must have a capability attribute that has a value of resourcelist. It must also have an at attribute that conveys the datetime at which the process of taking a snapshot of resources for their inclusion in the Resource List started, and it may have a completed attribute that conveys the datetime at which that process completed. A mandatory <rs:ln> child element of <urlset> points to the Capability List with the relation type up. In case a Resource List Index exists, a recommended <rs:ln> child element of <urlset> points to it with the relation type index. A mandatory <loc> child element provides the URI of the resource. Optional <lastmod> and <changefreq> child element with semantics as described in Section 7. An optional <rs:md> child element provides further metadata about the resource. It may have the attributes as described in Section 7. Optional <rs:ln> child elements link to related resources as described in Section 7, and detailed in Section 14. Example 14 shows a Resource List with two resources. The at attribute allows a Destination to determine that neither of the listed resources have undergone a change between their respective last modification datetimes, 2013-01-02T13:00:00Z and 2013-01-02T14:00:00Z, and the datetime that is the value of the at attribute, 2013-01-03T09:00:00Z. The ResourceSync framework adopts the community-defined limits for publishing documents of the <urlset> format and introduces a Resource List Index for grouping multiple Resource Lists. The union of the Resource Lists referred to in the Resource List Index represents the entire set of resources that a Source makes available for synchronization. This set of resources, regardless of whether it is conveyed in a single Resource List or in multiple Resource Lists via a Resource List Index, represents the state of the Source's data at a point in time. The mandatory <rs:md> child element of <sitemapindex> must have a capability attribute that has a value of resourcelist. It must also have an at attribute that conveys the datetime at which the process of taking a snapshot of resources for their inclusion in the Resource List Index started, and it may have a completed attribute that conveys the datetime at which that process completed. A mandatory <rs:ln> child element of <sitemapindex> points to the Capability List with the relation type up. A mandatory <loc> child element provides the URI of the Resource List. An optional <lastmod> child element with semantics as described in Section 7. An optional <rs:md> child element with an at attribute and possibly a completed attribute to convey the datetime at which the process of taking a snapshot of resources for their inclusion in the Resource List respectively started and ended. The Destination can determine whether it has reached a Resource List or a Resource List Index based on whether the root element is <urlset> or <sitemapindex> respectively. A Resource List Index that points to three Resource Lists is shown in Example 15. Example 16 shows the content of the Resource List identified by the URI http://example.com/resourcelist1.xml. Structurally, it is identical to the Resource List shown in Example 14 but it contains an additional <rs:ln> child element of <urlset> that provides a navigational link with the relation type index to the parent Resource List Index shown in Example 15. This link is meant to ease navigation for Destinations and their adoption is therefore recommended. In order to provide Destinations with an efficient way to copy a Source's data using a small number of HTTP requests, a Source may provide packaged bitstreams for its resources. A Source may publish a Resource Dump, which provides links to packages of the resources' bitstreams. The Resource Dump represents the Source's state at a point in time. It may be used to transfer resources from the Source in bulk, rather than the Destination having to make many separate requests. The ResourceSync framework recommends the use of the ZIP file format as the packaging format. Communities may define their own packaging format, but need to be aware that doing so will have a negative impact on cross-community interoperability. A Resource Dump should only point to packages of the same format. The mandatory <rs:md> child element of <urlset> must have a capability attribute that has a value of resourcedump. It must also have an at attribute that conveys the datetime at which the process of taking a snapshot of resources for their inclusion in the Resource Dump started, and it may have a completed attribute that conveys the datetime at which that process completed. In case a Resource Dump Index exists, a recommended <rs:ln> child element of <urlset> points to it with the relation type index. A mandatory <loc> child element provides the URI of the package. A recommended <rs:md> child element to convey the Media Type and the length of the package using the type and length attribute, respectively. The element may also have an at attribute and possibly a completed attribute to convey the datetime at which the process of taking a snapshot of resources for their inclusion in the package respectively started and ended. The child element may further have attributes such as hash, as described in Section 7. An optional <rs:ln> child element with the relation type contents that points to the Resource Dump Manifest associated with the bitstream package. Example 17 shows a Resource Dump that points to three ZIP files. Included in each <url> element is a pointer to the Resource Dump Manifest associated with the package. While this pointer is optional and intended for the Destination's convenience, if provided, the Source needs to ensure that the referred Manifest corresponds with the Manifest included in the bitstream package. If a Source needs to or chooses to publish multiple Resource Dumps, it must group them using a Resource Dump Index, in a manner that is similar to what was described in Section 11.2. Each ZIP package referred to from a Resource Dump must contain a Resource Dump Manifest file that describes the package's constituent bitstreams. The file must be named manifest.xml and must be located at the top level of the ZIP package. The mandatory <rs:md> child element of <urlset> must have a capability attribute with a value of resourcedump-manifest. It must also have an at attribute that conveys the datetime at which the process of taking a snapshot of resources for their inclusion in the ZIP package started, and it may have a completed attribute that conveys the datetime at which that process completed. A mandatory <loc> child element provides the URI that the Source associates with the bitstream. Optional <lastmod> and <changefreq> child elements with semantics as described in Section 7. A mandatory <rs:md> child element must have a path attribute to convey the location of the bitstream within the package. The value of the attribute is relative to root of the package and it is expressed with a leading slash (/). The use of the type attribute in the <rs:md> element is recommended to help Destinations determine the Media Type of the bitstream. The <rs:md> element may further have the attributes hash and length, as described in Section 7. Example 18 shows a Resource Dump Manifest for a ZIP file that contains two bitstreams. A Source may publish a record of the changes to its resources. This enables Destinations to efficiently learn about those changes and hence to synchronize incrementally. A Change List is a document that contains a description of changes to a Source's resources. It is up to the Source to determine the publication frequency of Change Lists, as well as the temporal interval they cover. For example, a Source may choose to publish a fixed number of changes per Change List, or all the changes in a period of fixed length, such as an hour, a day, or a week. All entries in a Change List must be provided in forward chronological order: the least recently changed resource must be listed at the beginning of the Change List, while the most recently changed resource must be listed at the end of the document. If a resource underwent multiple changes in the period covered by a Change List, then it will be listed multiple times, once per change. The mandatory <rs:md> child element of <urlset> must have a capability attribute that has a value of changelist. It also has the mandatory from and the optional until attributes to convey the temporal interval covered by the Change List. Details about the semantics of these attributes are provided below. In case a Change List Index exists, a recommended <rs:ln> child element of <urlset> points to it with the relation type index. A mandatory <loc> child element provides the URI of the changed resource. A mandatory <rs:md> child element must have the attribute change to convey the nature of the change. The value of the change attribute is created, updated, or deleted. The element may also have attributes datetime, hash, length, and type, as described in Section 7. Optional <rs:ln> child elements link to related resources as described in Section 7 and detailed in Section 14. When a document carries the until attribute, this indicates that the document will not be updated anymore; the Change List is closed. When a Destination has finished processing a closed Change List, it should consult the enclosing Change List Index (following the link with the index relation type), if applicable, or the Capability List (following the link with the up relation type) to determine the URI of the Change List that reports the changes that occurred after the datetime expressed as the closed Change List's until value. When a document does not carry the until attribute, this indicates that the document will be updated with further changes; the Change List remains open. A Destination should continue to poll an open Change List to learn about further changes. It does not need to consult the enclosing Change List Index, if applicable, nor the Capability List. The from and until attributes help a Destination to determine whether it has or has not fully processed a Change List. The forward chronological order of changes in a Change List, the datetime of a resource change (if provided), and the URI of a changed resource help the Destination to determine the first unprocessed change in a not fully processed Change List. The Destination should start processing there; it can retrieve a representation of a changed resource by dereferencing its URI provided in the <loc> child element of the <url> element that conveys the change. Example 19 shows a Change List that indicates that four resource changes occurred since 2013-01-03T00:00:00Z: one creation, two updates, and one deletion. One resource underwent two of these changes and hence is listed twice. The Change List has no until attribute, which indicates that it may report further changes; a Destination should keep polling this Change List. This example illustrates differences between the optional <lastmod> element and the optional datetime attribute. The creation event is for a resource that has a <lastmod> earlier than the event's datetime and before the from datetime of the Change List. The first update event shows a matching <lastmod> element and datetime attribute. The second update event has neither a <lastmod> element nor a datetime attribute, though its position in the Change List indicates that it was a later update of the resource. The Source can make it easier for a Destination to determine which change event it has last processed by providing a datetime attribute for each event. If a Source needs to publish multiple Change Lists, it must group them in a Change List Index. A Change List Index must enumerate Change Lists in forward chronological order. The mandatory <rs:md> child element of <sitemapindex> must have a capability attribute that has a value of changelist. It also has the mandatory from and the optional until attributes to convey the temporal interval covered by the Change List Index. The semantics of these attributes are as explained in detail for Change Lists. A mandatory <loc> child element provides the URI of the Change List. If the Change List is closed the use of <until> is required. If the Change List is open <until> must not be provided. The Destination should determine whether it has reached a Change List or a Change List Index based on whether the root element is <urlset> or <sitemapindex> respectively. A Change List Index that points to three Change Lists is shown in Example 20. Two of those Change Lists are closed, as indicated by the presence of the until attribute, and one is open, as indicated by its absence. The closed Change List http://example.com/20130102-changelist.xml is shown in Example 21. The open Change List could be the one shown in Example 19, in which case that list would have an additional link with an index relation type pointing to the Change List Index. In order to reduce the number of requests required to obtain resource changes, a Source may provide packaged bitstreams for changed resources. To make content changes available for download, a Source may publish Change Dumps. A Change Dump is a document that points to packages containing bitstreams for the Source's changed resources. The ResourceSync framework specifies the use of the ZIP file format as the packaging format. Communities may define their own packaging format. A Change Dump should only point to packages of the same format. It is up to the Source to determine the publication frequency of these packages, as well as the temporal interval they cover. For example, a Source may choose to publish a fixed number of changes per package, or all the changes in a period of fixed length, such as an hour, a day, or a week. If a resource underwent multiple changes in the period covered by a package, then the package will contain multiple bitstreams for the resource, one per change. As new packages are published, new entries are added to the Change Dump that points at them. All entries in a Change Dump should be provided in forward chronological order: the least recently published package listed at the beginning of the Change Dump, the most recently published package listed at the end of the document. The mandatory <rs:md> child element of <urlset> must have a capability attribute that has a value of changedump. It also has the mandatory from and the optional until attributes to convey the temporal interval covered by the Change Dump. The semantics of these attributes are as explained in detail for Change Lists. In case a Change Dump Index exists, a recommended <rs:ln> child element of <urlset> points to it with the relation type index. A recommended <rs:md> child element to convey the Media Type and the length of the package using the type and length attribute, respectively. It may also have the from and until attributes to convey the temporal interval covered by the package. The child element may further have attributes such as hash, as described in Section 7. An optional <rs:ln> child element with the relation type contents that points to a copy of the Change Dump Manifest associated with each package. Example 22 shows a Change Dump with pointers to three bitstream packages associated with changed resources. The absence of the until attribute indicates that further packages will be added. The example also includes within each <url> element a pointer to a copy of the Change Dump Manifest associated with the package. This pointer is optional and intended to allow a Destination to determine whether the package should be downloaded. If such pointers are provided, the Source must ensure that the Manifest referred to matches the Manifest included in the bitstream package. If a Source needs to publish multiple Change Dumps, it must group them in a Change Dump Index, in a manner similar to what was described in Section 12.2. Each ZIP package referred to from a Change Dump must contain a Change Dump Manifest file that describes the constituent bitstreams of the package. The file must be named manifest.xml and must be located at the top level of the ZIP package. All entries in a Change Dump Manifest must be provided in forward chronological order: the bitstream associated with the least recent resource change is listed first, and the bitstream associated with the most recent change is listed last. The mandatory <rs:md> child element of <urlset> must have a capability attribute that has a value of changedump-manifest. It also has the mandatory from and the optional until attributes to convey the temporal interval covered by the ZIP package in which the Change Dump Manifest is contained: bitstream for all resource changes that occurred during the specified interval must be included in the ZIP package and the Change Dump Manifest must refer to each. A mandatory <loc> child element provides the URI which the Source associates with the bitstream. A mandatory <rs:md> child element must have a change attribute to convey the type of change the resource underwent. The change attribute value may be created, updated, or deleted. Except in the case of change="deleted", the element must also have a path attribute to convey the location of the bitstream within the ZIP package. The path is relative to root of the package and it is expressed with a leading slash (/). The use of the type attribute in the <rs:md> element is strongly recommended to help Destinations determine the Media Type of the bitstream. The <rs:md> element may further have the attributes datetime, hash and length, as described in Section 7. Example 23 shows the Change Dump Manifest associated with the second entry in the Resource Dump from Example 22. The Manifest must be named manifest.xml at the top level of the ZIP package. A copy of the Manifest may also be provided at a location indicated by an optional <rs:ln> element with the relation type contents in the Change Dump, http://example.com/20130102-changedump-manifest.xml in Example 22. The Manifest covers the same changes as conveyed in the closed Change List of Example 21. The resource http://example.com/res7.html is listed twice, once because it was created, and once because it was updated. Both entries have the same URI. The ZIP package in which this Manifest is contained has two bitstreams for this resource, available at different paths in the package. The Source makes the resource content available at a mirror location. The Source provides alternate representations for the resource. The Source details the difference between the current and the previous version of the resource. The Source makes a resource as well as metadata about the resource available for synchronization. The Source provides access to prior versions of the resource. The Source provides collection membership information about the resource. A Destination republishes a resource obtained from a Source, makes that republished resource available for synchronization (i.e. acts as a Source itself), and links to the original resource that it republished. As always, the <loc> child element of <url> conveys the URI of the resource that is subject to synchronization. The related resource is provided by means of the <rs:ln> child element of <url>. The possible attributes for <rs:ln> as well as the link relation types used to address the aforementioned use cases are detailed in Section 7. Links to meet needs other than the ones listed may be provided, and appropriate relation types may be selected from the IANA Link Relation Type Registry or expressed as URIs as specified in RFC 5988, Sec. 4.2. In case a Destination is not able to adequately interpret the information conveyed in an <rs:ln> element, it should refrain from accessing the related resource and rather use the URI provided in <loc> to retrieve the resource. A mandatory rel attribute with a value of duplicate. A mandatory href attribute that conveys the URI of the mirrored resource. An optional pri attribute to express a prioritization among multiple mirror locations, each expressed by means of an individual <rs:ln> element. The use of pri is detailed in Section 7. Other attributes are as described for the <rs:ln> child element of <url> in Section 7. Example 24 shows how a Source conveys information about prioritized mirror locations for a resource. Since the three locations conveyed by <rs:ln> elements point to duplicates of the resource specified in <loc>, the values for each of the attributes of <rs:md> are expected to be identical for the resource and its mirrors. Hence, they should be omitted from the <rs:ln> elements. The last <rs:ln> element points to a mirror location where the resource is accessible via a protocol other than HTTP as can be seen from the URI scheme. Even though the resources are duplicates, their last modified datetimes may vary. A resource may have multiple representations available from different URIs. A resource may, for example, be identified by a generic URI such as http://example.com/res1. After performing content negotiation with the server, a client may, for example, obtain the resource's HTML representation available from the specific URI http://example.com/res1.html. Another client may ask for and retrieve the PDF representation of the resource from the specific URI http://example.com/res1.pdf. Which representation a client obtains, can depend on its preferences in terms of Media Type and language, its geographical location, and its device type. A mandatory rel attribute with a value of alternate. A mandatory href attribute that conveys the specific URI of the alternate representation of the resource. A recommended type attribute that conveys the Media Type of the alternate representation. Other attributes, as described for the <rs:ln> child element of <url> in Section 7. Cases exist in which there is no generic URI for a resource, only specific URIs. This may occur, for example, when a resource has different representations available for different devices. In this case the URI in <loc> will be a specific URI, and <rs:ln> elements with an alternate relation type are still used to refer to alternate representations available from other specific URIs. Example 25 shows how to promote a generic URI in <loc> while also pointing to alternate representations available from specific URIs, for example, through content negotiation. A mandatory rel attribute with a value of canonical. A mandatory href attribute that conveys the generic URI associated with the specific URI provided in <loc>. This approach might be most appropriate for Resource Dump Manifests and Change Dump Manifests that describe bitstreams contained in a ZIP file. Example 26 shows a Source promoting a specific URI in <loc> while also pointing to the resource's generic URI by means of an <rs:ln> element. Metadata pertaining to the representation available from that specific URI is conveyed by means of attributes of the <rs:md> element. In order to increase the efficiency of updating a resource, a Source may make a description available of the changes that the resource underwent, in addition to the entire changed resource. Especially when frequent minor changes and/or changes to large resources are concerned, such an approach may be attractive. It will, however, require an unambiguous way to describe the changes so that a Destination can construct the most recent version of the resource by appropriately patching the previous version with the description of the changes. A mandatory rel attribute with a value of http://www.openarchives.org/rs/terms/patch. A mandatory href attribute that conveys the URI of the description of the resource changes. A mandatory type attribute that conveys the Media Type of the change description. That Media Type must be such that it allows the unambiguous application of the described changes to the previous version of the resource to construct the current one. Example 27 shows a Source that expresses changes that a JSON resource underwent expressed using the application/json-patch Media Type introduced in JSON Patch. It also shows the Source conveying changes to a large TIFF file using an experimental Media Type that may, for example, be described in a community specification. A Destination that does not understand the Media Type should ignore the description of changes and use the URI in <loc> to obtain the most recent version of the resource. Another example of a well-specified Media Type for expressing changes to XML document is application/patch-ops-error+xml, as specified in RFC 5261. Expressing resource changes in this manner is only applicable to Change Lists (as in Example 27) and Change Dumps. When doing so for a Change Dump, the entry in the Change Dump Manifest must have the path attribute for the <rs:ln> element that points to the change description that is included in the content package. A mandatory rel attribute. When pointing from a resource to metadata that describes it, the rel attribute's value is describedby; when pointing from metadata to the resource described by the metadata, its value is describes. A mandatory href attribute. When pointing from a resource to metadata that describes it, the href attribute's value is the URI of the metadata resource; when pointing from metadata to the resource described by it, the value is the URI of the described resource. Example 28 shows how a Source may express this inter-relationship between the two resources. Note that a Destination can use the metadata that describes a resource as a filtering mechanism to only synchronize with those resources that meet its metadata-based selection criteria. Note also in the <url> element that conveys the metadata record update, the use of the link with a profile relation type [RFC 6906] to express the kind of metadata that is used to describe the resource (in this case, the kind of metadata is expressed by means of its XML Namespace). The link should provide a URI that supports the Destination in interpreting the metadata information. For example, it could refer to a namespace, an XML schema, or a description of MARC. The existence of a time-generic URI from which, at any moment in time, the current representation of the resource is available. The existence of a time-specific URI for each resource version, from which a specific temporal version of the resource is available. When communicating about the resource, its time-generic URI is provided in the <loc> element. The <lastmod> element may be used to provide the resource's last modification time. A mandatory rel attribute with a value of memento. A mandatory href attribute that conveys the time-specific URI of the resource that corresponds with the time of last modification. This URI allows a Destination to obtain that specific version during a catch-up operation, for example, because it had been offline, even if the resource has meanwhile changed again. The last modified datetime of the resource version identified by the time-specific URI is conveyed by the value of the modified attribute. A mandatory rel attribute with a value of timegate. A mandatory href attribute that conveys the URI of TimeGate associated with the time-generic resource. The other attributes described for the <rs:ln> child element of <url> in Section 7 should not be used as they are meaningless for TimeGates. A mandatory rel attribute with a value of timemap. A mandatory href attribute that conveys the URI of TimeMap associated with the time-generic resource. Example 29 shows a Change List with a link to a prior version of a resource, a link to a TimeGate, as well as a link to a TimeMap. Note that the values of the hash, length, and type attributes are identical between the <rs:md> child element and the <rs:ln> child element that points to the prior version. A mandatory rel attribute with a value of collection. A mandatory href attribute that conveys the URI that identifies the collection. Example 30 shows a Change List with one resource that is a member of an OAI-ORE Aggregation. A mandatory rel attribute with a value of via. A mandatory href attribute that conveys the URI of the resource at the original Source. Example 31 shows a Change List in which a Source publishes information about a change to a single resource. Example 32 shows a primary aggregator's Change List that refers to the original Source's resource. It includes a link with the relation type via that has attributes such as href to convey information about the origin of the resource. This information corresponds with the data provided in the <url> block of the Change List shown in Example 31. For example, the value of the href attribute in Example 32 equals the value of the <loc> child element in the <url> block in Example 31. If a secondary aggregator obtains the changed resource by consuming the Change List of the primary aggregator and republishes its Change List, a chain of aggregations is created. In this case each aggregator should maintain only the existing via link in order to convey information about the origin of the resource. Example 33 shows the Change List of a secondary aggregator with information about the changed resource and the via link equal to Example 32. The data conveyed with the link corresponds to the data provided in the <url> block in Example 31. The values of the at, completed, from, and until attributes must always be expressed from the perspective of the Source that publishes the document that contains them. Hence it is possible that the from datetime of a Change List is more recent than the <lastmod> datetime of the original Source's resource described in the Change List, which is conveyed using an <rs:ln> link with the via relation type. An aggregator should be cautious when inheriting links, other than the one with the via relation type, from a Source that precedes it in an aggregation chain. It should make sure that each such link remains appropriate from its own perspective and refrain from inheriting it when it is not. For example, a link with the relation type collection or canonical expressed by the original Source may not be appropriate in the context of the aggregator's copy, and hence should not be included in the description of the changed resource in the aggregator's capability document. Table 4 provides an overview of the requirements for use of the at and from attributes in ResourceSync documents. The top label in the column headings represents the <sitemapindex> root element for index documents, and the <urlset> root element for all other documents. The child label in the column headings represents the <sitemap> child element for index documents, and the <url> child element for all other documents. The optional attributes completed and until are not shown in the table, but they may be added wherever the corresponding at and from attributes are mandatory, recommended, or optional. Table 4 shows that, for example, a Change List must contain the <rs:md> child element of the <urlset> root element with the attribute from to convey the temporal interval covered by the Change List. NISO standards are developed by Working Groups of the National Information Standards Organization. The development process is a strenuous one that includes a rigorous peer review of proposed standards open to each NISO Voting Member and any other interested party. Final approval of the standard involves verification by the American National Standards Institute that its requirements for due process, consensus, and other approval criteria have been met by NISO. Once verified and approved, NISO Standards also become American National Standards. These standards may be revised or withdrawn at any time. For current information on the status of this standard contact the NISO office or visit the NISO website at: www.niso.org. Section 1, Introduction, discusses the purpose and scope and provides example use cases and includes a Walkthrough, introducing the core components of the ResourceSync framework by example. Section 2, Normative References, lists references to other standards/specifications that are required for conformance with this standard. Section 3, Definitions, introduces terminology important for the understanding of this standard. Section 4, Namespace Prefix Bindings, identifies the namespaces used for this specification. Section 5, Synchronization Processes, provides a high-level overview of the various ResourceSync capabilities and shows how these fit in processes aimed at remaining in step with resource changes. Section 6, Framework Organization, describes the overall organization of the ResourceSync framework: structure, navigation, and discovery. Section 7, Sitemap Document Formats, describes the way in which the document formats introduced by the Sitemap protocol are used to convey synchronization related information in all ResourceSync capabilities. Section 8, Describing the Source, and Section 9, Advertising Capabilities, describe how a server should convey the ResourceSync capabilities it supports. Section 10, Describing Resources; Section 11, Packaging Resources; Section 12, Describing Changes; Section 13, Packaging Changes; and Section 14, Linking to Related Resources, each provide details about a capability that a server may implement in order to enable remote systems to remain aligned with its evolving data. Appendix A, Time Attribute Requirements, provides an overview of the requirements for use of the at and from attributes in ResourceSync documents. Revisions to the standard reflect changes to fix problems related to the conflation of last modification date of a resource and the datetime of notification of a change to the resource. Wherever used in this standard, all terms that are trademarks or service marks are and remain the property of their respective owners. The following were members of the ANSI/NISO Z39.99-2017 ResourceSync voting pool that approved this standard. NISO approval of this standard does not necessarily imply that all Voting Pool members voted for its approval. This specification is the collaborative work of NISO and the Open Archives Initiative. Initial funding for ResourceSync was provided by the Alfred P. Sloan Foundation. UK participation was supported by Jisc. We also thank numerous individual contributors including: Martin Haye (California Digital Library), David Rosenthal (Stanford University Libraries), Ed Summers (Library of Congress), and Vincent Wehren (Microsoft).